[Updated] Tropical Storm Fiona is a “potential threat” to Bermuda and its closest point of approach to the island within 72 hrs is forecast to be 312nm to the south-south-east at 6.00pm on Tuesday [August 23], the Bermuda Weather Service said this evening. The latest forecast from the U.S. National Hurricane Center says, “At 5.00pm AST, the center of Tropical Storm Fiona was located near latitude 21.2 North, longitude 49.1 West. 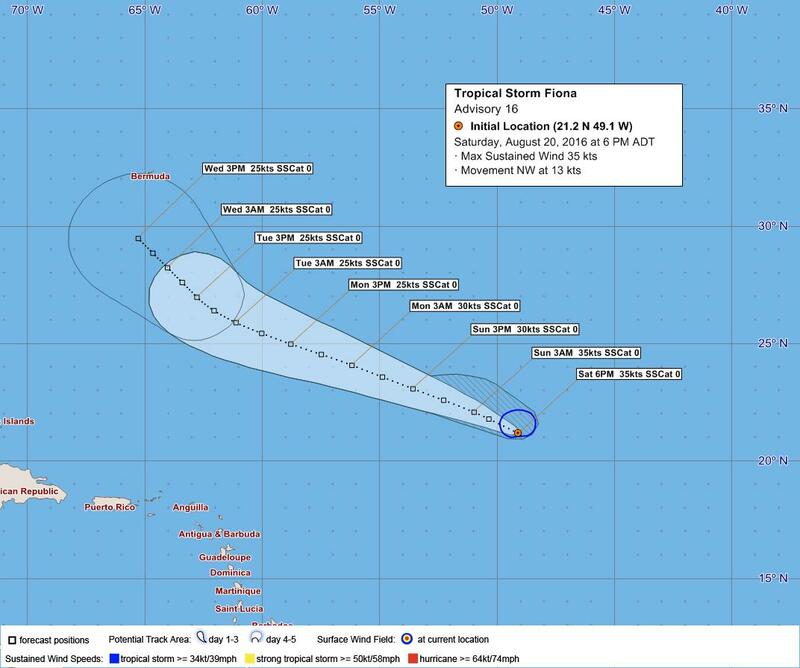 Fiona is moving toward the northwest near 15 mph [24 km/h]. A slight turn to the west-northwest is expected tonight or on Sunday. “Maximum sustained winds remain near 40 mph [65 km/h] with higher gusts. Fiona is forecast to weaken to a tropical depression tonight or early Sunday, and it could degenerate into a remnant low on Monday. Let us brace up and be ready! Historically speaking are worst normally comes after Sept 5th until the 2nd week in October. I think the word is “our”. Should be nothing more than a rainy day, unless she restrengthens after another bust of convection. Nonetheless, we should be prepared. Remember de last storm,it’s a tropical storm, wait no its a Hurricane. And our Emergency system is not working. The PLP raised it so we all know it is almost fixed.